The statue of George and the Dragon in Old Eldon Square, Newcastle. Location: West Street, Gateshead. Materials: Cast Iron. Status: Listed Grade II. Gothic style casr iron clock tower staning 25ft high in the forecourt of the old Town Hall. 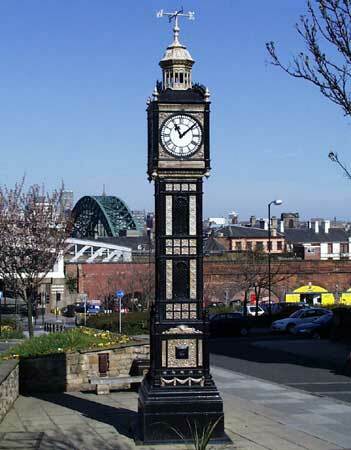 Painted black and gold and inscribed "Presented to the Borough of Gateshead by Walter Willson, Mayor 1892." The clock is an exact facsimile of one at Victoria Station, London.